CNC machining and welding has proven to be an extremely sound career choice up to today, with well above average beginning wages and a good outlook to the future. It would make sound advice to direct any student towards a career in welding; it even makes sense for the older generation to learn the trade in this tough economy. Learning a technical skill such as welding can take quite some time to master; however, you should be able to learn the basics that may make you valuable as a beginning welder to potential employers in about a year or so. This amount of time will vary by the individual and the training they receive. There’s more to welding than most people think. Just the different types of welding can be overwhelming to the average person. Following is a list of welding tips that are meant to be used as helpful hints. They are geared more towards the apprentice than the seasoned professional welder found in the best machine shop. 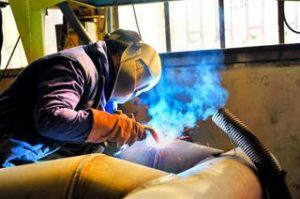 MIG Welding, or Metal Inert Gas Welding, is a technique of welding whereby the filler metal supplies the electric current and maintains the arc. The arc remains shielded from access air with an inner gas – generally Argon. It combines two pieces of metal with a consumable wire connected to an electrode current. 1. Always keep 1/4” to 3/8 in stickout. Stick out is the electrode that extends from the tip off the contact tube. 2. Always use a smaller diameter for thin metal. For thicker medals, you can use a larger wire and a larger machine. 3. Always use a proper shielding gas co2 is generally good from penetrating welds on steel; however, it could be too hot for thin metals. 4. Only use Argon when working with aluminum. 5. There are two common types of wire types for working with steel. For rusty or dirty steel, Use ER70S-wire on your welding projects. 6. To keep the most control of the bead on your weld, always keep the wire directed towards the leading edge of the weld-pool. 7. To avoid improper wire feeding, always try to keep the gun pointed as straight as possible while you’re welding. 8. Whenever possible use both hands as you weld, it will allow you to keep the guns steady as you work. 9. In order to avoid contaminants that can lead to poor welds, always keep your wire in a dry, clean location. TIG Welding is also referred to as Tungsten Inert Gas Welding. It uses an inert gas along with non-consumable Tungsten to weld two pieces together. The Tungsten electrode supplies the electricity and not the filler for the weld process. It occasionally creates a weld where one part melts into the other. 1. Use only Argon shielding for stainless, aluminum, and steel. 2. When using the TIG torch, always use the push technique. 3. Always match the collet size with the Tungsten electrode size. Aluminum MIG Welding or Metal Inert Gas Welding is the same as MIG welding, with the properties of aluminum considered. 1. Use only Argon for a shielding gas. 2. Always be sure to clean the aluminum before you begin welding. This removes the oxide layer. 3. Always use a stainless steel brush that has only been used on aluminum. 5. For all purpose work, the most common wire used is ER4043. Where higher strength welds are required, ER5356 is commonly used. 6. When welding aluminum, only use a push gone technique. 7. If you ever have problems wire feeding, you can try using a contact tip that’s a size larger than that wire you’re using. 8. Whenever possible, use a spool gun for feeding wire. If you don’t have access to a spool gun, then use the shortest gun available and keep it as straight as possible as you work. Remember that learning to weld is an acquired skill that takes time and lots of practice. There will be times when you become extremely frustrated; however, if you stick with it and learn the proper techniques, it will pay off for you in the long run.